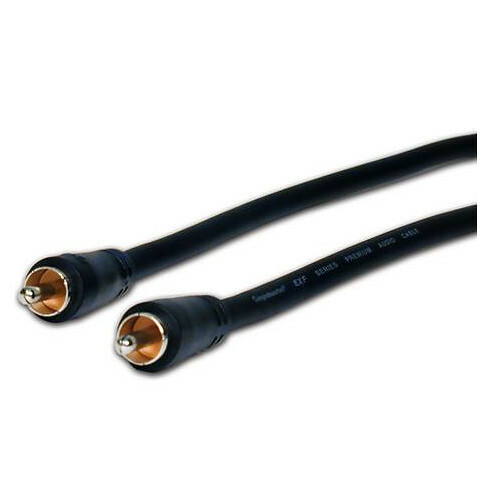 The Comprehensive EXF 10' RCA Plug to Plug Premium Audio Cable from the EXF (EXtended Frequency) audio cables features 100% microweave bare copper shielding and CFP low loss dielectric for fast and accurate wide bandwidth signal transfer. This audio cable is terminated with premium-molded nickel over brass RCA connectors. It features the Xtra-Flex black matte finish with a non-glare jacket. Box Dimensions (LxWxH) 6.6 x 6.4 x 0.7"
EXF 10' RCA Plug to Plug Premium Audio Cable is rated 5.0 out of 5 by 1. Rated 5 out of 5 by Schottie from Works great!!!! Broke my old sub woofer cord and this one was a great replacement. Thanks B & H!